There are at least $2 billion reasons why the decision was made to split the third The Hunger Games book, Mockingjay, into two movies. Money aside, though, the decision gave the filmmakers a ton of freedom, and allowed them to craft a more satisfying arc. The kind of freedom not even Katniss Everdeen could win. 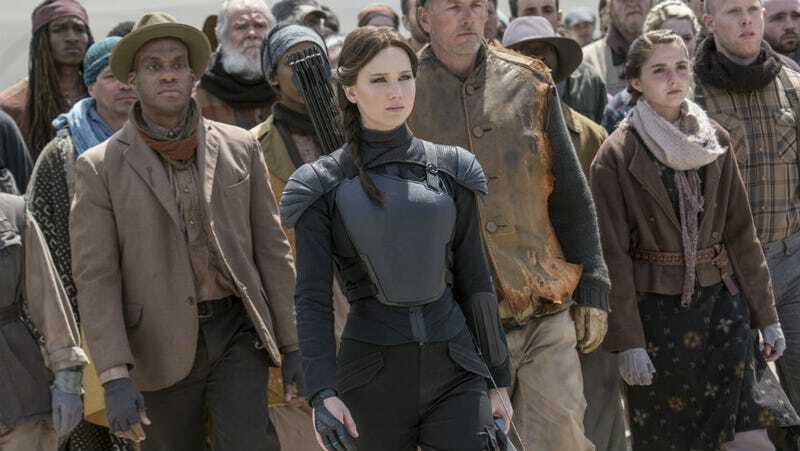 We spoke to director Francis Lawrence and producer Nina Jacboson, and they told us why Mockingjay is really two stories. The Hunger Games series started as a trio of popular books written by Suzanne Collins. Those books got optioned by Jacobson, bought by Lionsgate, and then turned into three uber-successful films with the fourth, The Hunger Games: Mockingjay Part 2, opening November 20. It’s expected to be one of the biggest hits of the year. Lawrence was looking forward to completing the story, too. He directed three out of the four movies in the series, so breaking up Mockingjay gave him a chance to do a great many things. First of all, he was able to make two back-to-back movies that are incredibly different from the first two in the series, the first of which was directed by Gary Ross. Lawrence confessed that when it came to the second movie, he worried it would feel too much like a repeat of the first one. Not only does part one go in a new direction, part two is even more different. It becomes a bigger version of what we’ve already seen, which makes it an ideal finale to the series. It’s an exponential expansion of the idea that started the whole series. Expanding the story also gave the filmmakers opportunities to concentrate more on key moments and expand characters who were crucial, but otherwise secondary, in the books. One example is President Coin, played by Julianne Moore. So, because there was a whole other movie to fill, it gave Lawrence and the team the ability to round out the character, which they did with the help of both Moore and Collins. “We wanted to make sure that there was an evolution for Coin,” said Lawrence. “You know, we got some flack for splitting the movies, I think they’re two distinct stories, but really, that kind of evolution would be a much, much, much more difficult thing to do in the course of two hours, versus the course two films,” he said. The split also allowed Mockingjay Part 2 to really give audiences some huge, huge set pieces that might have been rushed in a single film. One in particular, set under the streets of the Capitol, is expertly crafted, with music that taunts your expectations, and camera work that dazzles your eyes—bringing to mind similar franchise movies like The Avengers and The Lord of the Rings. Star Jennifer Lawrence did all her own stunts in the scene (save for one very obvious one) and when your lead actress goes to that level for the film, the director knows the audience should see it. And while the music in the scene is one of the highlights, it was a late addition, and not even something Lawrence originally planned. Now, we’re going to talk about how expanding the novels into two movies affected some of the bigger events in the book. Jump ahead to the next photo if you haven’t read Mockingjay. First up is the moment we all know is coming. The big reveal. The death of Katniss’ sister Prim. In the book, this happens very quickly and out of nowhere, so both Lawrence and Jacobson felt that was the way to handle it in the movie. And yet, because there was more time, Mockingjay Part 2 is able to play more with Katniss’s reaction to it. The death happens so quickly and so in the heat of battle, it takes several scenes for Katniss to even process it, which adds a new layer of complexity. Any healing at all is seen in the polarizing epilogue, which jumps into the future to reveal the final fates of the main characters. Originally, filming of that scene was scheduled during the shooting of Mockingjay Part 1, but weather, and the fact they had another movie to shoot, changed that. Quite poetically, this ended up being the final scene Lawrence shot with the full crew. With the franchise now coming to its close, Lawrence and Jacobson have different, but equally lofty, views on how they want history to remember it. Whether or not either of those things happen, the only reason they’re a possibility is because Suzanne Collins did something so special with her books. So is this really then end? Can Lionsgate and this team really leave this franchise, at the peak of its popularity? Jacobson says yes. Unless something very special happens.